Manage airport takeoffs and landings to avoid collisions and minimize delays. Work quickly, but stay alert for traffic conflicts. Part two in the Airport Madness series. If you liked the first version of this game, you will love this one. Click on an aircraft to bring up it's control panel, where you may give takeoff, landing or taxi clearances. As an air traffic controller in this game, your job is to keep aircraft from colliding, while trying to avoid creating unnecessary delays. You will have to pay attention and keep your eyes moving. As in real life, there is always something you could be doing. You must give takeoff clearances, landing clearances and taxi clearances in a strategic effort to maintain safety and efficiency where there would otherwise be total chaos. Clicking on an aircraft will bring up its' control panel. The panel contains control buttons as well as basic information about the flight. USE KEYBOARD HOTKEYS "1" AND "2" TO ACCESS THE MENU OPTIONS. The mouse will also work. Arrivals will land themselves without any input from you, and can also be slowed down, or even "pulled up" if the spacing between other aircraft is too close or if a collision is imminent. After an aircraft lands, it stops before crossing other runways until you give permission to cross. Departures will wait patiently at the gate for you to give them a "taxi clearance". Once they have their taxi clearance, they will taxi and stop at the edge of their departure runway until you give them a takeoff clearance. Your starting salary is $30,000 and your wages increase based on your efficiency. Don't let the aircraft wait! As they sit on the taxiway waiting, you lose money. Every aircraft begins with a bonus value of approximately $2000, which slowly erodes as the clock ticks. If you delay them too much, their bonus will become 0. 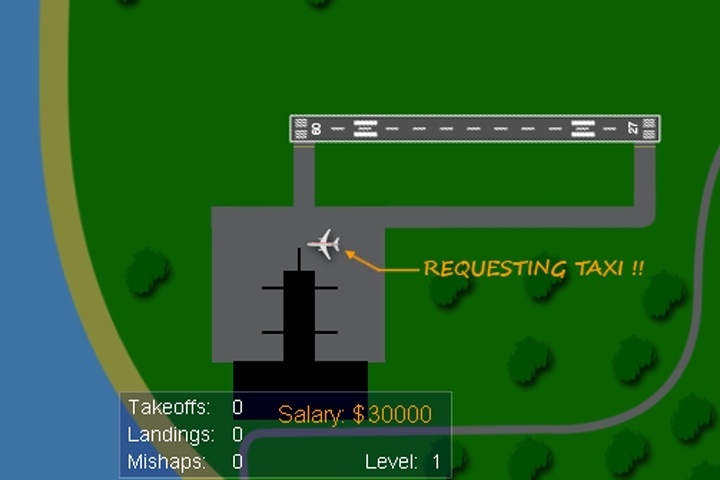 The bonuses get added to your salary as departing aircraft commence takeoff, and as arriving aircraft reach their gate. Crashes will cost you $10,000. When you have a crash, the level gets reset and your score goes back to where it was at the beginning of that level, minus $10000. Have three crashes and your game is over. You're washed up! Finished. Don't push it. If you don't think there will be enough time to squeeze out an airplane, let him sit. "Line up" an aircraft on the runway before giving them a takeoff clearance. This gives you the ability to run planes even tighter so that you can score an even larger salary. If a collision is imminent, "pull up" the arriving aircraft. They will climb straight ahead. You will lose $1000 for each "pull up", but it's worth it if it prevents disaster. If you want to play Airport Madness 2 games online you have come to the right place! GamesLoon adds new Airport Madness 2 games every week. This is your game portal where you can find the biggest collection of free Airport Madness 2 games online. Do not forget to rate our Airport Madness 2 free online games while playing!